TEHRAN, Nov. 5 (MNA) – Tehran’s Niavaran Cultural Center will be hosting performances of tazieh, Iranian passion play, for a ten-night program that begins tomorrow. The Ravian-e Eshq Troupe, which has been invited from Qom Province, will perform the taziehs during the first ten nights of the lunar month of Muharram, the month in which Imam Hussein (AS) arose to struggle against the Umayyad ruler Yazid’s oppression in 680 CE. The performances, which will be held at the Persian Gulf Hall of the center at 8:00 p.m., are based on the events that occurred to Imam Hussein and his companions during his uprising. Tazieh recounts religious events, historical and mythical stories, and folk tales. Each performance has the four components of poetry, music, song and motion. Performers are always male, and female roles are played by men, most of whom are amateurs who earn their livelihood through other means but perform for spiritual rewards. 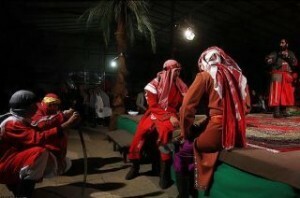 Tazieh was registered on UNESCO List of the Intangible Cultural Heritage of Humanity in November 2010. The center is also scheduled to hold a photo exhibit entitled “Ashura Cuisines” as part of the program at the Persian Gulf Hall. In addition, the Niavaran Café Gallery will host a photo exhibition entitled “The Grief of My Village”, which will display works by photographer Mehdi Qorbanzadeh Abyaneh. He has depicted the rituals, which are held annually during Muharram in Abyaneh, a historical village near the city of Kashan in central Iran.